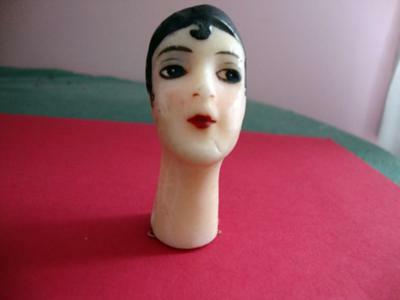 I found this head in my grandmothers sewing chest that was given to me after my Mothers death. I have been trying to find out how to retore it with a body and clothes. It has painted head but there is a slight indentation on top. Not sure if it had a wig. Is there anyone that could give me information on this? It is only 2 1/4" high and the head is 4" diameter. It has two holes at the base of the neck where there is a string tied.